Oil and Natural Gas Corporation Limited invites Online Applications from desirous candidates for the regular posts for Dehradun and Delhi with the pay scales as mentioned below. All the Candidate whose who are eligible and interested may check all the details. Admit card for ONGC Recruitment 2015 is available now. Candidates can check through the details given below. The link for checking form is also given below. 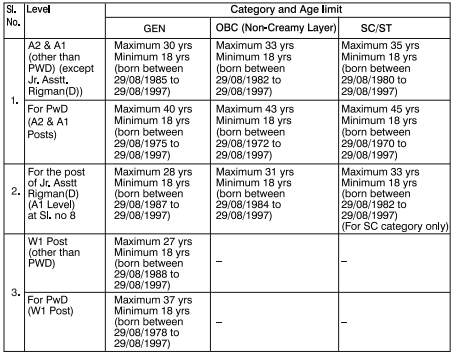 Eligibility Criteria for ONGC Recruitment 2015 is mentioned below. Candidate can check all details before applying from the link given below. Ex- Servicemen: To the extent of lenth of service in Armed Forces Plus 3 years as per Govt. Rules except for the posts of Jr. Asstt. Rigman (Drilling). For Disabled Defense Service personnel extent of Age Concession is upto 45 years for General/OBC 50 Years for SC/ST except for the post of Jr. Asstt. Rigman (Drilling). 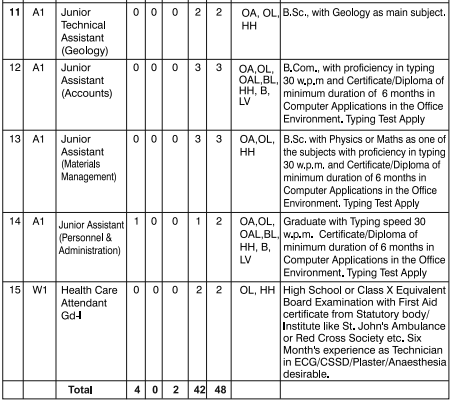 ONGC Department candidate based Employee: To the extent of lenth of service in ONGC except for the posts of Jr. Asstt. Rigman (Drilling). Tenure Based Field Operators(TBFOs) who are discharging the role of Rigman on Drilling Rigs in ONGC will be given age relaxation for the post of Jr. Asstt. Rigman (Drilling) to the extent of service rendered by them in ONGC on Drilling Rigs.However uper age of 50 years for TBFOs shall be applicable. Candidate seeking reservation as SC/ST /OBC, will have to submit at the time of interview, caste certificate. Application Form for ONGC Recruitment 2015 is available now. Candidates can apply through the details given below. The link for applying Online is also given below. Elilgible candidates would be required to apply on-line only through the link available on ONGC website: www.ongcindia.com from 1000 hours on 07.08.2015 to 1800 hrs on 28.08.201`5. no other mode of application shall be accepted. No changes shall be allowed once the candidate has submitted his/her online application. Candidale should retain the copy of their system generated Registration slip, Bank Challan etc. for future reference. print out of the same should not be tampered with. No document including copy of Bank challan, Registration slip etc are to be sent ONGC unless specifically asked for. All information regarding examination shall be available on the website of ONGC — www.ongcindia.com. Candidates can download examination admit cards/ interview call letters from the sits. Admit cards/interview call letters shall also b sent to candidates by past. ONGC will not be responsible for any loss of mail/e-mail/SMS sent due to invalid or wrong Address/email ID/mobile phone no. or due to postal delays or loss etc. or delivery of emails to span/bulk mail folder. For General and OBG candidates- Rs300/- as Registration fee & for SC/ST)Ex-servicemen candiciates – Rs100/- as Processing fee. Over and above the Registration/Processing fee, an amount of Rs20/- shall be payable to the bank as bank charges. PwD candidates are exempted to Pay any fee. Registration/ Processing fee is non-refundable. ONGC Departmental candidates/Tenure based employees would also be required to deposit the applicable registration/proceesing fee through the Challan form. However, the same ‘would be reimbursable. Candidates has to qualify written test and interview. Written test is tentatively schedule on 20.09.2015 at Dehradun and Delhi. Candidates are required to click the link “generation of the BANK CHALLAN” (fee payment voucher) and enter necessary details like Name, Date of birth, Mobile no and Amount. A Bank Challan with Bank Reference Number (the reference number will be unique) will be generated. The Bank Challan will be generated only up to 20/09/2015 (upto 23.59 hrs) from the date of issue of advertisement. The system generated Bank Challan will be in triplicate (1st Copy – Bank Copy, 2nd CopyCandidate‟s Copy and 3rd Copy-DMRC‟s copy). Candidates are required to take a print out of this system generated Bank Challan and deposit the requisite Written Examination Fee (for fee details see para “Payment of application fee”) in any branch of State Bank Of India (SBI) after a minimum of 24 hrs of generation of the Bank Challan only, State Bank of India (SBI) has been authorized by DMRC to collect the application fee, in a specially opened DMRC Account No. 33700092265. Candidates are now ready to apply online, only after a minimum of two working dates of depositing the fee in the bank, by re-visiting the career link i.e., “DMRC/PERS/22/HR/2015 (71) & (72)” on DMRC‟s website www.delhimetrorail.com and by going to sub link titles “Apply Online” and follow the instructions given therein carefully for Online Registration. Candidates will have to upload scanned copy of GATE-2014 or 2015 Score card, passport colour photo, signature scan copy, prescribed qualification/Marksheet, OBC/SC/ST certificates. The size of these scanned copies should be within 100kb and in pdf files only. Once you submit your application, the system will generate a unique Registration No. and generate a Registration Slip, which will have unique Registration number your basic details like name, category and post applied for. Community/Caste certificate in Central formats (SC/ST/OBC), for seeking age relaxation etc, with the registration slip. (All these formats are available on DMRC‟s website DMRC website www.delhimetrorail.com). No other format will be acceptable. UR & OBC (including Ex-servicemen) candidates are required to pay a Non-refundable fee of Rs. 400/- (inclusive of bank charges plus service tax) and SC/ST candidates are required to pay a non-refundable fee of Rs. 150/- (for processing fee only, inclusive of bank charges plus service tax). DU released notification for admission in BHMS course for the academic session 2015-2016.The course of BHMS is conducted at Nehru Homoeopathic Medical College, Defence Colony, New Delhi.100 seats are available for admission to BHMS Course for the Academic Session 2015-2016. Candidates who want to take admission in DU BHMS course can apply. It is being informed to all the interested aspirants that DU BHMS Admission Result has been declared. Candidate can check merit list from the link given below. He/She must have attained or will attain the age of Seventeen (17) years as on 31st December 2015. (i) For 85% Delhi Quota Seats : The candidates seeking admission to BHMS course must have passed Intermediate/Senior School Certificate Examination (CBSE)/Indian School Certificate Examination (12 years course) or any other equivalent Examination recognised by the University of Delhi for admission to Undergraduate courses with 60% or more marks in the aggregate of three subjects i.e. Physics, Chemistry, Biology and has also passed English as one of the subject from a recognised school conducting regular classes situated within the National Capital Territory of Delhi (except Patrachar Vidyalaya and Open School). While deciding the merit the marks obtained in English will not be taken into consideration. (ii) For 15% All India Quota Seats (except Delhi quota) : The candidates from all over India who have passed the prescribed qualifying examination from an Indian University/Board (12 years course) from a recognised school conducting regular classes or any other equivalent Examination recognised by the 8 University of Delhi for admission to Undergraduate courses with 60% or more marks in the aggregate of three subjects i.e. Physics, Chemistry, Biology and has also passed English as one of the subject (except Patrachar Vidyalaya and Open School). While deciding the merit the marks obtained in English will not be taken into consideration. (iii) The percentages of above quota will be interchangeable. The candidates in order to become eligible for admission to BHMS course under OBC category must obtain 54% marks in qualifying examination i.e. Board XIIth examination. The candidates in order to become eligible for admission to BHMS course under SC/ST categories must obtain 50% marks in qualifying examination i.e. Board XIIth examination. Provided that the student has passed all the subjects separately required for the purpose of admission to BHMS Course. All the admitted candidates in BHMS Course are required to submit a Certificate that he/she has passed 8th Class Examination with Hindi. If he/ she is failed to submit the same certificate he/she will not be awarded the degree of BHMS Course. The candidates belonging to General-Pwd category must have secured a minimum of 55% marks, Pwd -SC/ Pwd -ST categories must have obtained a minimum of 50% marks and Pwd -OBC categories must have obtained a minimum of 54% marks in qualifying examination i.e. Board XIIth examination. By hand in person against Bank Draft /Banker’s Cheque of 750/- (Seven Hundred Fifty Only) between 09.30 A.M. to 03.00 P.M. (except lunch time) in favour of Registrar, University of Delhi on all working days from Monday to Friday upto 31/07/2015. By post against Bank Draft / Banker’s Cheque of 800/- (Eight Hundred only) in favour of Registrar, University of Delhi by sending a self addressed envelop of 10″X 8″ upto 17/07/2015. By hand in person against Bank Draft /Banker’s Cheque of 550/- (Five Hundred Fifty Only) between 09.30 A.M. to 03.00 P.M. (except lunch time) in favour of Registrar, University of Delhi on all working days from Monday to Friday upto 31/07/2015. By post against Bank Draft / Banker’s Cheque of 600/- (Six Hundred only) in favour of Registrar, University of Delhi by sending a self addressed envelop of 10″X 8″ upto 17/07/2015. SIGNATURE: Signature (in Black ink) against white background is to be SCANNED and UPLOADED in the space earmarked in the Online Application Form and as per the guidelines given on website. Candidates must ensure that the signatures are identical throughout the Recruitment process at all stages and/or places. If any variation is found between the signatures, the candidature is liable to be cancelled. Candidates are advised to confirm their uploaded signature is clearly visible/identifiable at the appropriate place. File size of signature should be between 10kb-20kb. Candidate will have to fill up the requisite information like Candidate’s Name, Gender, Date of Birth, Category, Religion, whether Person is with Disability, whether Departmental employee, Written Test Centre, Post applied for, Educational Qualification, E-mail Id, Mobile Number, Experience, Communication Address, Registration No of Employment Exchange, if registered, Declaration, etc. On submission of Details, Candidate will be prompted to check the filled up details and fill/make corrections if any, otherwise to SUBMIT his/her final data. “Upload Photograph and Signature”. The image file of Photograph and Signature should be in .JPG or .JPEG format. Submission of Application: The candidate may review all the filled information before clicking on the declaration. Candidates exempted from Application fee will get a Registration Number as confirmation through SMS and/or E-mail, which can be used along with combination of Date of Birth to print the Registered Application Form. The candidate can make payment through Internet banking/ Debit Card (Visa or Masters) / Credit Card (Visa or Masters) / Bank e- Challan. After making the payment a Payment Slip will be generated on screen, the candidates should take the print of that payment slip or save for further reference. Candidates who wish to make payment through e-Challan will visit the link ‘https://www.onlinesbi.com/’ and follow the instructions to download the e-Challan. The candidate will visit the nearest SBI branch to make cash payment and obtain SBI Collect Reference Number and revisit the online portal to furnish the necessary payment details to complete the registration process. It is mandatory to submit the details of SBI Collect Reference Number (10 digit alphanumeric reference number starting with DU) printed on e-receipt and deposit date again in online portal by login through Unique Payment Reference Number after making the payment within due date. Bank commission charges will be borne by the Applicants. Candidates are required to take print out of ‘Registered Application Form’ filled through online mode and send it to through ordinary post only to the address: Post Box No 9248, Krishna Nagar Head Post Office, Delhi – 110051 along with the following self attested documents. Self-attested Copy of Registered Application Form downloaded from website. Self attested Photocopy of PWD certificate issued by Competent Authority, if applicable. Self attested Photocopy of certificates in case of Ex-Serviceman issued by Competent Authority. Self attested Photocopy of Application Fee Receipt, if applicable. Self attested copy of any other documents as required. Bharat Coking Coal Limited, a Mini-Ratna Company, Govt. of India Undertaking engaged in Coal Mining activities invites applications from Indian citizens, who fulfill the prescribed qualifications, age, experience etc. for the posts indicated below for its Central Hospital/Regional Hospitals/ different Dispensaries and Area/Unit/Departments of the Company. 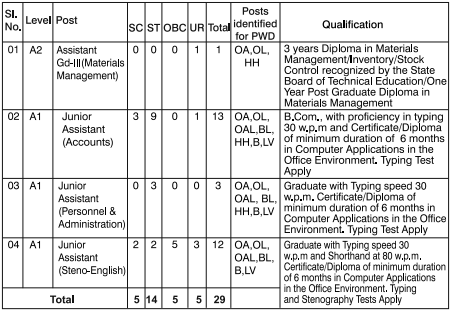 Total vacancy details of BCCL Recruitment 2015 for various posts are given below category wise. Candidate should check details before applying. 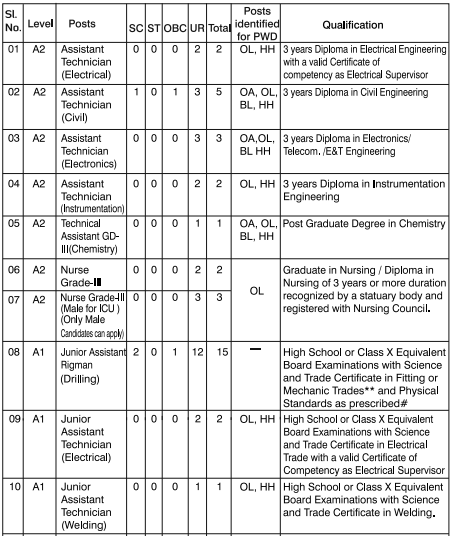 Higher Secondary (10+2)/Intermediate & two years experience certificate as ECG Technician in a hospital under a Cardiologist/Physician or in a reputed Nursing home having ECG service under a Cardiologist/Physician. Preference shall be given to graduates and to those who can handle running repair of the equipment. Note: Entry of eligible candidates as per qualification as prescribed above will be in Tech. & Sup. Gr. 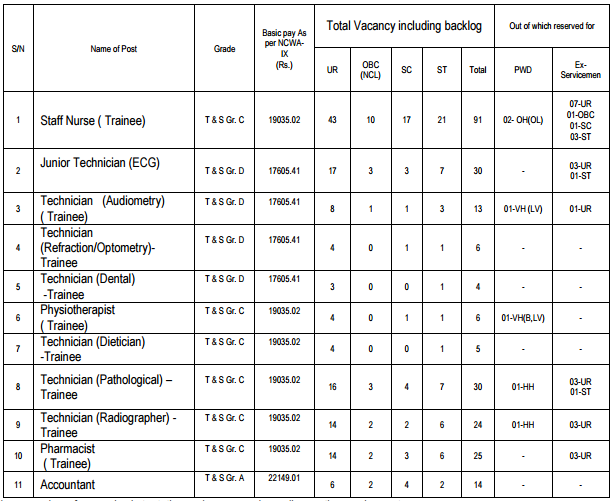 D and on completion of 03 years experience in Company hospitals, they may be considered for placement in Tech. & Sup. Gr. C after holding a Trade Test. Higher Secondary (10+2)/Intermediate plus Diploma in Audiometry from Govt. recognised Institute. Minimum Educational/Technical Qualification: Higher Secondary (10+2)/Intermediate plus Diploma in Dentistry/Dental Technology from Govt. recognised Institute. Diploma in Physiotherapy from Govt. recognised Institute (minimum 3 years course). Note: Entry of recognised diploma holders in physiotherapy will be in Tech. & Sup. Gr. C as Physiotherapist (Trainee) for one year. On successful completion of one year training, they will be regularized in T & S Grade-C as Physiotherapist. Note: Entry of Technician-Dietician will be in Tech. & Sup. Gr. C as Trainee for 01 year. After successful completion of one year training, they will be regularized as Technician Dietician in T & S Grade-C. The Technician Para Medical Staff who are matriculate and who have served in Army for a period of at least 10 years prior to retirement shall also be treated as possessing the desired qualifications laid down for the post of Technician(Pathological)-Trainee in T&S Grade-C.
After successful completion of one year training, they will be regularized as Technician (Pathological) in T & S Grade-C. Diploma in Radiography from an Institute recognised by the Government. The Technician Para Medical Staff who are matriculate and who have served in Army for a period of at least 10 years prior to retirement shall also be treated as possessing the desired qualifications laid down for the post of Technician (Radiographer) -Trainee – T&S Gr. C.
10+2 with science and Diploma in Pharmacy registered with Pharmacy Council under Pharmacy Act. 1948 with valid registration. The upper age limit is relaxed by 10 years for PWD candidates, 15 years for PWD candidates belonging to SC/ST and 13 years for PWD / PH candidates belonging to OBC (NCL) on production of disability certificate having 40% or more disability as required under rules. Age relaxation by 5 years for candidates who were ordinarily domiciled in the state of Jammu & Kashmir during the period 01/01/1980 to 31/12/1989. The language of the test shall be bilingual, i.e. English and Hindi. The test shall be conducted by using OMR sheets. Candidates are advised to make themselves well versed with the use of OMR Sheet. 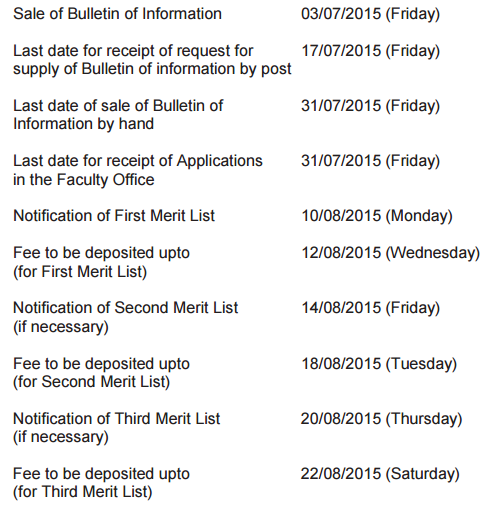 Admit Card for BCCL Recruitment 2015 can be download after the registration date is over. All the applicants are being informed by various means. All they have to do is download the BCCL Admit Card from the link given below. A candidate should select any one of the following examination centre while filling the online Application Form.